The word alicatado comes from the Arabic alcâ’ât which refers to patios. 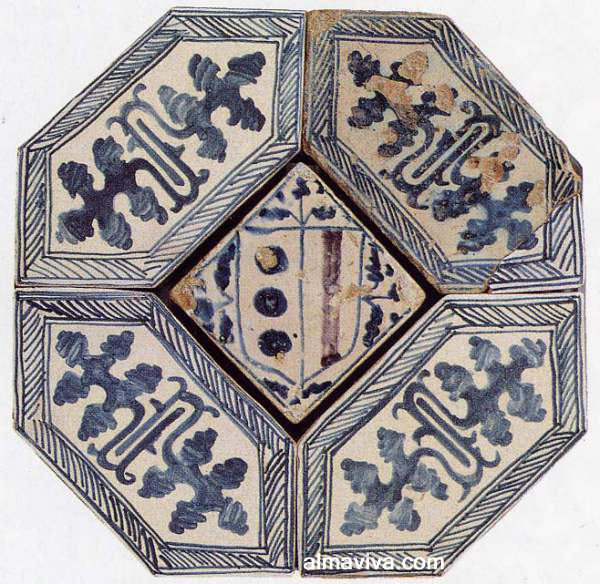 An alicatado is a composition of fragments of tiles of various sizes and coulours. This technique is close to mosaic. This technique was developed and much used in Al-Andalus (modern day Spain) under the Moors. 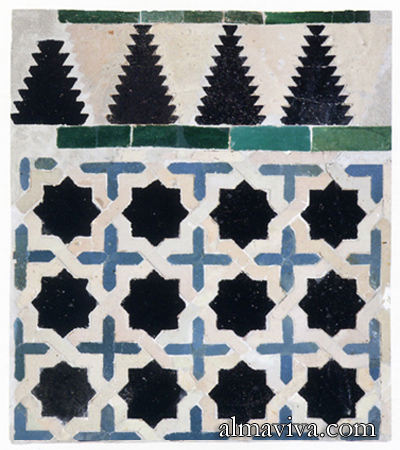 Many examples of walls covered with Mudéjar alicatados can be admired in the Alhambra of Granada or in the chapel of San Bartolomé in Cordoba. This art of ceramic is much related to the Morrocan zellige. An alicatado in the Alhambra of Granada. See examples of alicatados in our gallery of zellige. 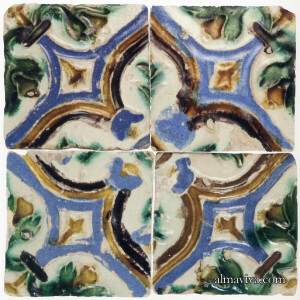 Arista tiles are glazed ceramic tiles produced in Al-Andalus. The word arista means ridges in Spanish. This Hispano-Moresque technique consists of stamping a tile of soft clay with a mould to create geometric patterns in relief. The ridges thus created form separate compartments which can be filled with coloured glazes. This technique is close to cloisonné. 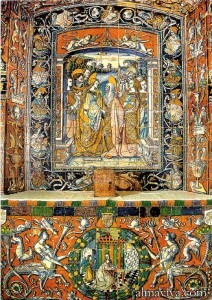 Francisco Niculoso (circa 1470 – 1529), said Niculoso Pisano, is an Italian maiolica painter of the Renaissance. He settled in Seville, Spain, in 1498, a few years after the end of the Reconquista and the discovery of America. He introduced in Spain the Italian technique of painting on an unbaked white tin glaze, a technique known as maiolica in Italy. He enabled the evolution of the Hispano-Moresque art of azulejos tiles from geometric patterns into the representation of sceneries. Niculoso painted ceramic panels that are true works of art; they are often signed with his name. Some of them can still be admired in their original places in Seville. 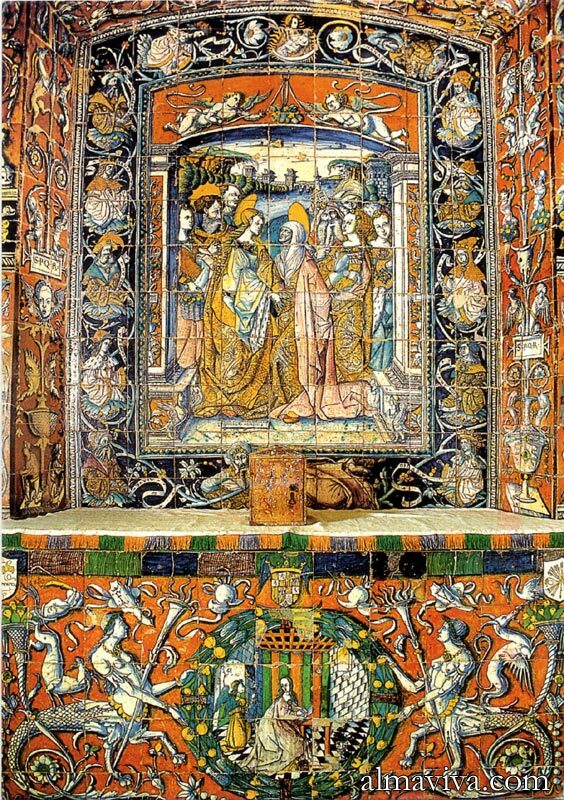 For instance the chapel of the Alcazar, a complete tile-work commissioned by the Catholic monarchs Isabella and Ferdinand (see below). Other examples are the church of Santa Ana in Triana, a borough of Seville, and the monastery of Santa Paula. Some of his tiles can be also admired in the Rijksmuseum of Amsterdam. A tin-glaze provides a surface to lay a painted decoration on a baked piece of ceramic. Tin oxide is a colorant that makes glaze opaque, thus enabling it to cover a fired piece of ceramic ( also known as biscuit). It was the interaction between the Islamic world and China around 850 A.D. that led to the development of tin-glaze in Persia, as a result of the the Persians’ desire to imitate white Chinese porcelain. The formula of stannic oxide is SnO2. An alfardon is an hexagonal tile used in pavements. In the world of ceramic, it is a word again with an Arabic root, like alicatado and azulejo. 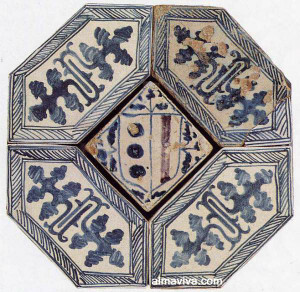 Usually four alfardones are settled around a square tile in ordre to form an octagon. 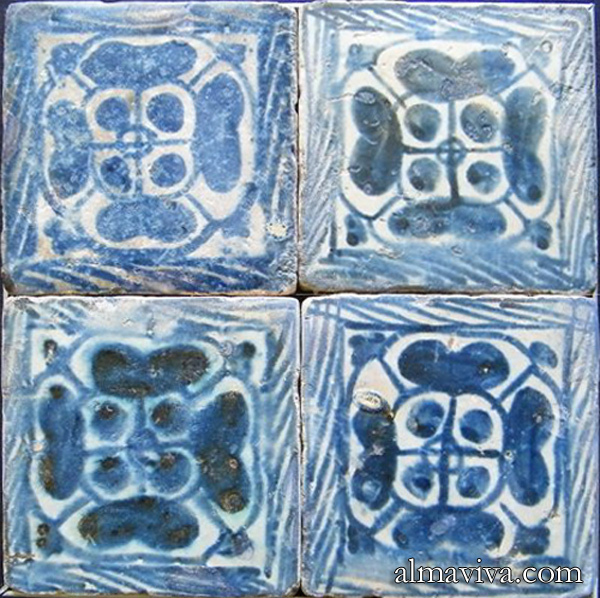 This pattern was also much used for maiolica pavements during the Italian Renaissance. The word zellige certainly has the same origin as azulejos. It is an ornamental technique that has grown in Spain and North Africa since the 12th century. It has became an integral part of Moroccan architecture where the finest examples can be admired. Its manufacturing process is reminiscent of both the mosaic and marquetry. Mud bricks are glazed, these monochrome bricks are baked, cut into geometric shapes (squares, diamonds, triangles, stars, crosses, various polygons …) and then combined to form joint geometric drawings, sometimes extremely complex. The edges of the sherds are chamfered so that when assembled, joints can be as thin as possible. 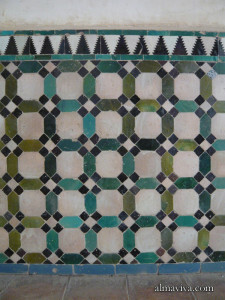 A second method is to scrape the enamel colour coat to design a pattern; the bare clay remaining on the rest of the tile. With this method the rigour of geometry is avoided and curves can be introduced. 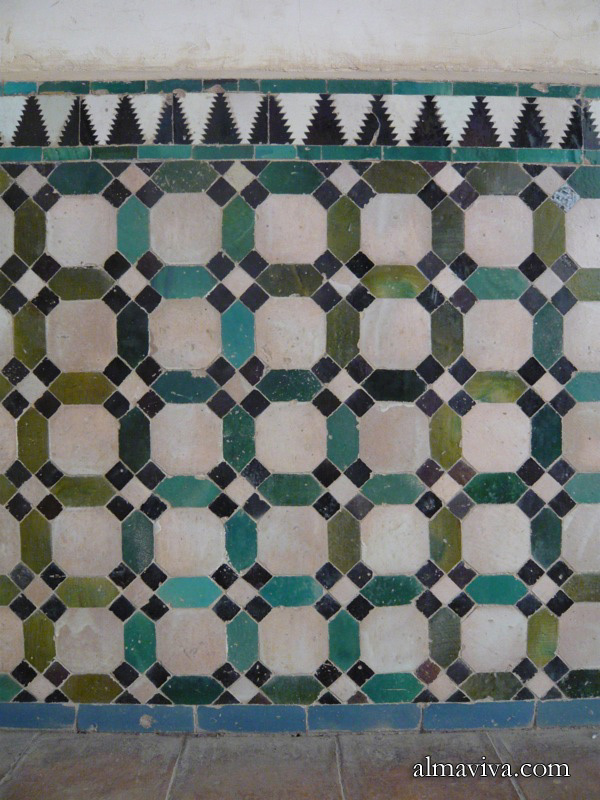 It is related the moorish alicatado technique admired in Spain in palaces like the Alhambra of Granada. See many examples in our gallery of zellige. The Sindh is a historical region situated in the Indus Valley, it is today one of the four provinces of Pakistan. This region is famous for its production of glazed ceramic (see Kashi gari). Rajola is a term sometimes used in Spain instead of azulejo. It is mostly used in Catalonia and in the region of Valencia. Porcelain is a hard, white, non-porous and translucent variety of ceramic ware invented in China around 800 AD. The clay is made of feldspath, quartz, petuntse (china-stone), and kaolin (china-clay). Petuntse (pai-tun-tzu) means hard paste in Chinese. Kaolin is said to be a corruption of the Chinese Kau-ling, meaning High Ridge, the name of a hill east of King-te-chen. This city is in the eastern province of Kiang-si, whence the earliest samples of the clay were sent to Europe in the early 18th century by the Père d’Entrecolles, a French Jesuit missionary. Chinese porcelain was immensely prized throughout the Orient and Europe. The secrets of its ingredients and production process were closely guarded for nearly a thousand years. It was indeed only in the early 18th century that, by sheer accident, Johann Schnoor, a Prussian, noticed an intensely white material sticking to his horses’ hooves. Curiously, he found it to be an excellent material for whitening wigs. A chemist analyzed the material and identified it as kaolin, one of the main ingredients of porcelain. As a result, the first European production centre of porcelain was started in 1710 in Prussia, in the city of Meissen. The discovery of kaolin at Saint-Yrieix, near Limoges, in France, and in Cornwall about the year 1750, enabled the extension of porcelain production throughout Europe. The main manufactures were: Vienna, Berlin, Venice, Chelsea and Worcester in England, Tournai in Belgium, Copenhagen, Saint-Petersburg, and Chantilly, Mennecy, Vincennes, and Sceaux, in France. A stencil is a perforated paper used to reproduce a decoration. The stencil is laid on the unbaked glaze and covered with charcoal powder. The black powder goes through the perforated holes and leaves dots on the white glaze. Those dots give an outline and help the painters. Stencils are also used to paint frescoes. The French word for stencil pochoir is also used in English.